Note – Note – Note: This replacement converter FAILED after the second trip, in June of 2015. Hopkins was contacted but refused to provide any technical assistance! 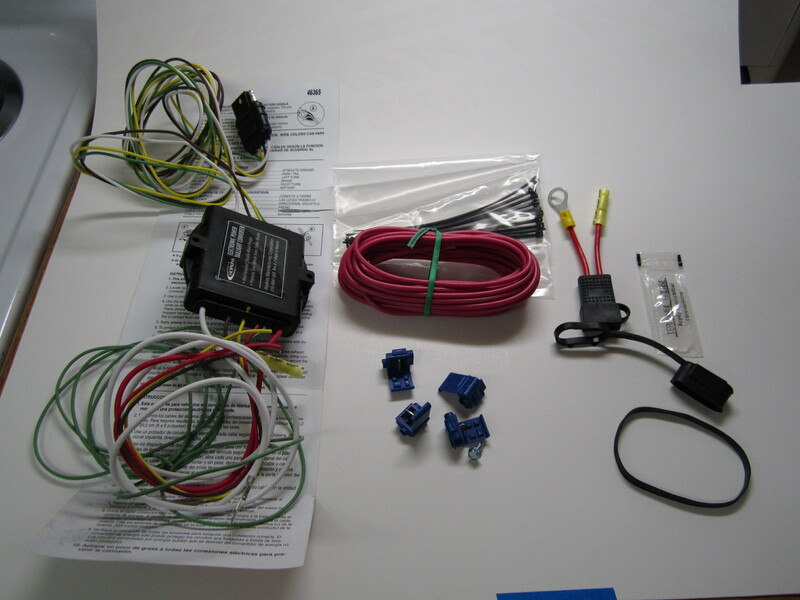 When I installed the BRP Hitch onto my 2013 Spyder ST in April, 2013 I did not expect to have the converter in the wiring loom that came with the BRP Hitch fail after just over a year, and only three trips with my tow-behind trailer…. but it did! What is even more disconcerting is that BRP forces their Spyder owners to purchase the incredibly expensive BRP Hitch else they lose the warranty on the Spyder itself… talk about blackmail.. that is the worst kind. I had planned on a four day trip from my home in Colorado Springs, leaving on the morning of 12/9/2014, to Boulder City, Nevada, to see the Boulder Dam, and then return via a more northerly route to see the Glen Canyon Dam near Page, Arizona. The weather for that four day trip was going to be outstanding… no rain, and with my heated clothing, perfectly comfortable on the frike (my term for a dual front wheeled trike!). But it was not to be. On the evening before leaving on the trip I had packed the trailer, checked the tire pressures in all tires and as an afterthought turned the key of the frike to check the running lights, turn signals and brake lights of the trailer…. Nothing! So much for my early December ride! A quick check at the connector between the frike and the tow-behind trailer using a volt meter verified that there was no voltage coming from the frike hitch loom to the trailer. 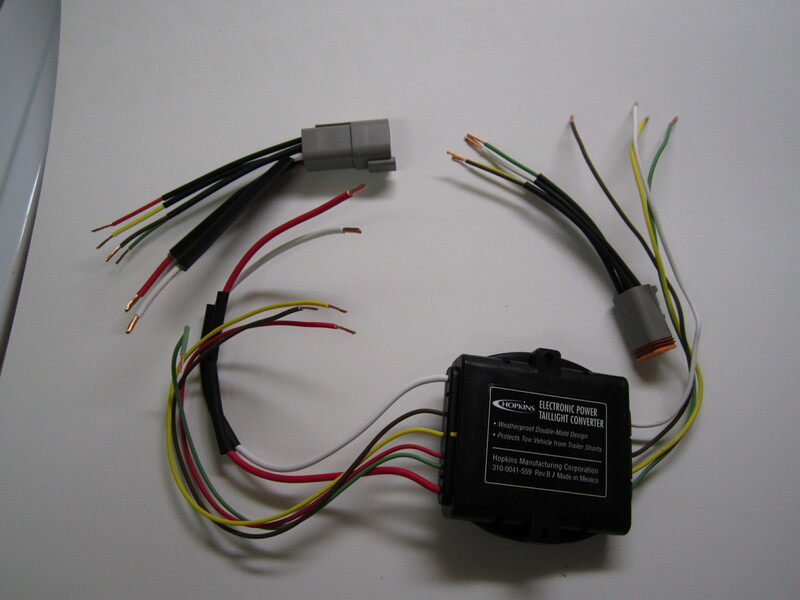 A secondary review of the Shop Manual for the frike indicated that there was no specific fuse for the frike’s trailer wiring connector under the passenger seat. At this point a failure of the converter in the hitch loom appeared to be the problem. My trip was definitely off! 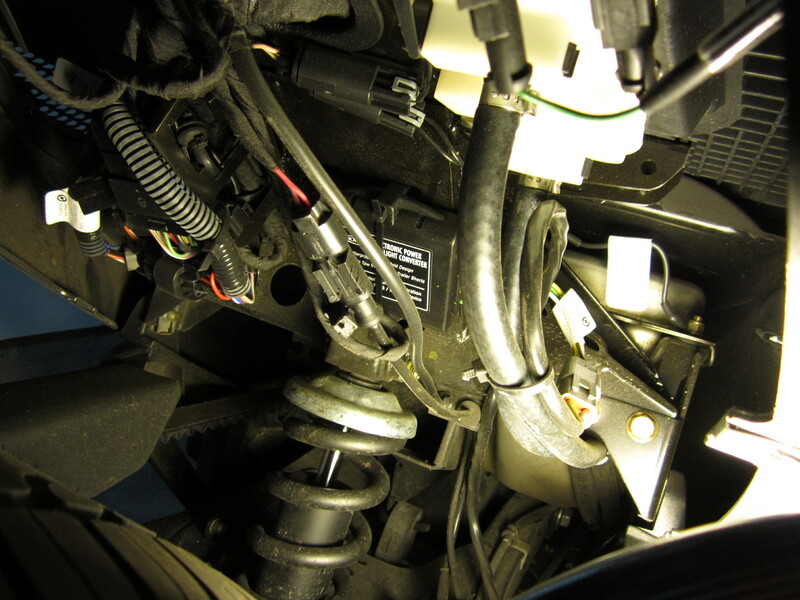 The picture below shows the old converter mounted just above the rear shock onto the frame, held in place with a black cable tie. 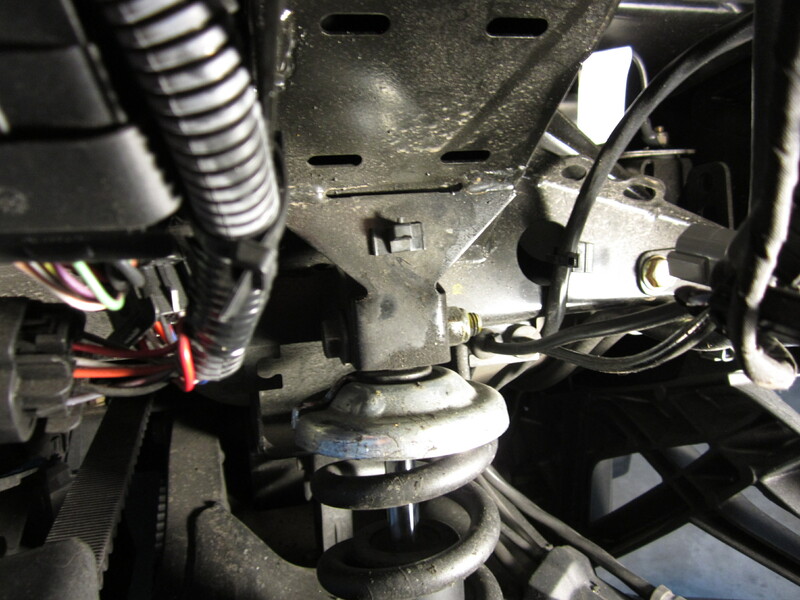 A search of the Internet revealed that the failure of this component of the BRP Hitch Kit was a common problem among those (of us) who had purchased the hitch. The forums were full of postings on this problem, with as many solutions as there were postings. After reading several postings a replacement product, Hopkins Kit #46365 seemed to be the best option for the repair. This kit is available on Amazon for around $45 (with free shipping!). A careful examination of the picture of Kit #46365 revealed that the number of wires on each side of the converter and the color of those wires was Exactly the same as the old converter. I could only hope that this was an indication that this kit was the correct replacement, electrically and functionally. 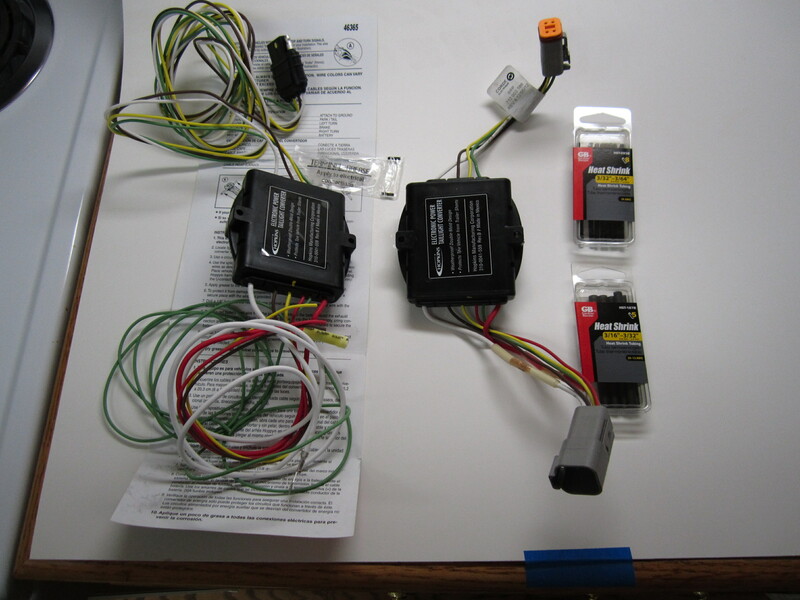 The picture below is of the replacement converter and the old converter with loom wiring connectors. Note that the colors of the wires of both converters are the same, and the positions and number of wires on both sides of the replacement converter are exactly the same… a comforting situation at this point in the project! The picture below shows the replacement converter with the wires on each side cut to about 12” in length, with the ends having the insulation removed. 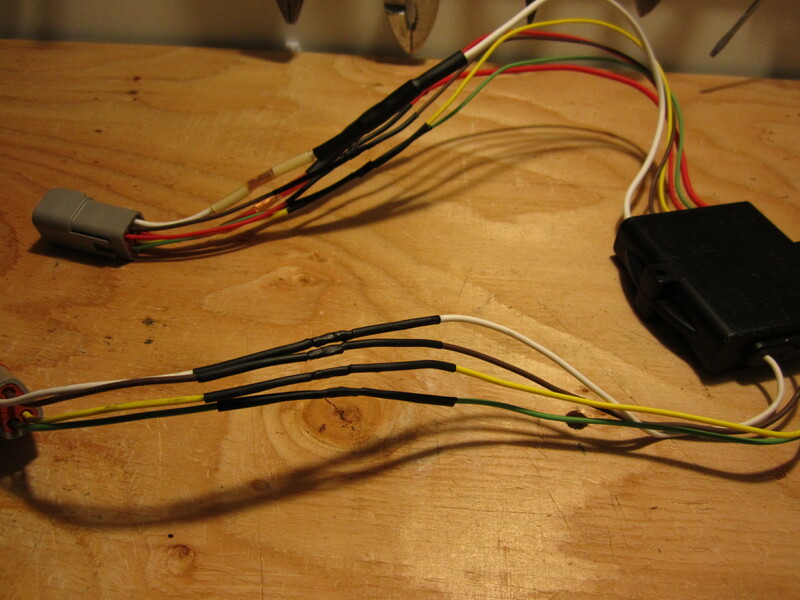 The connectors from the wiring loom have been removed from the defective converter, with the insulation from those wires also removed in preparation for soldering the wires of the new converter onto the loom connectors. Note also that shrink wrap tubing of the appropriate size has been installed onto each wire to be used to cover the soldered connectors after soldering. 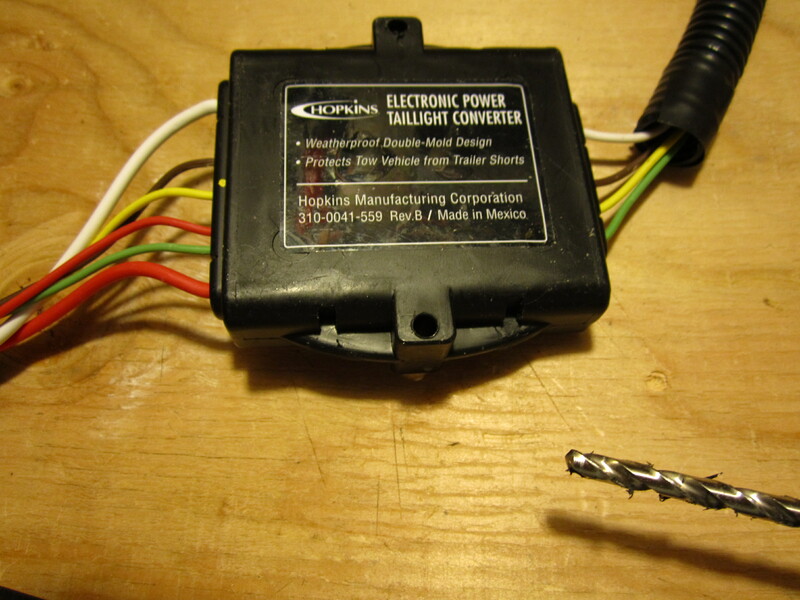 The picture below shows the new converter with the loom connectors soldered, with shrink wrap positioned (and shrunk) onto the soldered wire connections. The picture below shows the two holes on the top and bottom of the new connector being (carefully) enlarged so that the cable wire tie that will be used to attach the converter to the rear fender frame of the frike. The picture also shows the black, corrugated protective tubing installed on both sides of the converter to retain and protect the separate wires after the converter is installed. 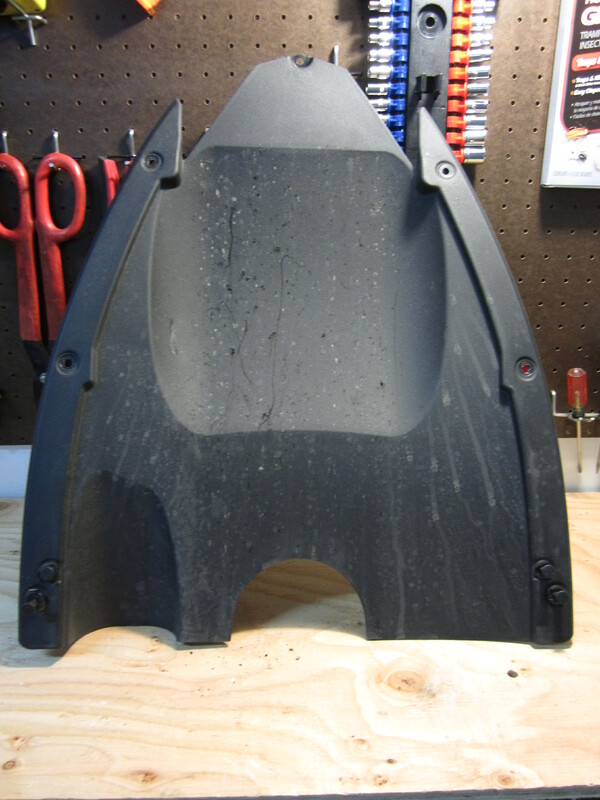 The picture below shows the place on the rear fender frame where the converter will be installed. The cable tie must be fished into the top slot and out of the bottom slot. I used a short piece of hanger wire with a J-shaped end to stick through the bottom slot and grab the end of the cable tie as I pushed it down from the top slot. A bit of ‘fishing’ will allow the capture of the tie through the bottom slot. 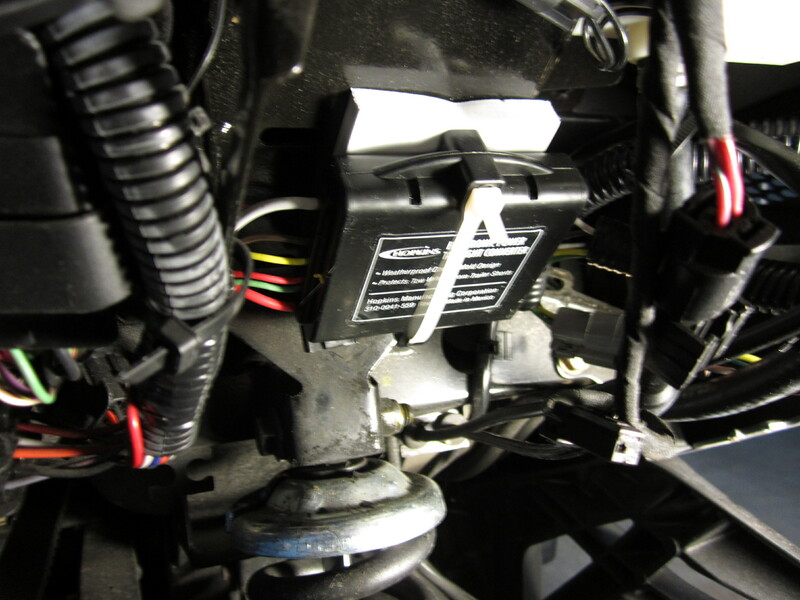 The picture below shows the new converter installed using the single cable tie. The white item behind the converter is a piece of foam that will provide some cushioning of the converter from the frike frame. The loom wiring on each side of the newly installed converter is secured on each side with cable ties to keep those wires from moving around during a ride on some of the rough roads I encounter on my touring. 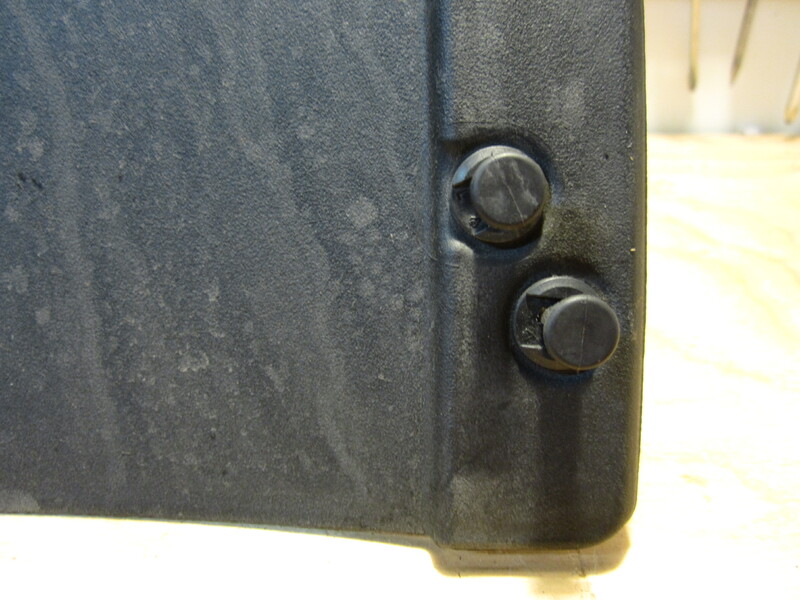 The underside fender cover is replaced using the five Torx screws and two push-pin plastic snaps. I would recommend Blue Loctite on each of the Torx screws to prevent vibration from loosening them from the frike. And finally, after everything was in place a turn of the ignition key lit up both the lights of the frike and the lights on the tow-behind trailer. Turn signal lights and brake lights were also tested and worked perfectly. It was indeed a good thing! Just one week ago I was just a few hours away from leaving on another frike touring adventure… but that was not to be. And now, just one week later, with the lighting on my tow-behind trailer working perfectly the weather is somewhere below freezing and the snow has just begun to fall, heavily, but I’m now ready for any four days in a row with clear weather between Colorado Springs and Boulder City at any time in the near future. Retired Computer Programmer. Born and Raised in Missouri. Graduated from Missouri School of Mines in 1964. Retired in 2003. Moved to Colorado in 2010. Enjoying good health and 'front range'. Touring frequently on Can-Am Spyder motorcycle. Skiing during the Winter months at Monarch Mountain Ski Area (for free! ).